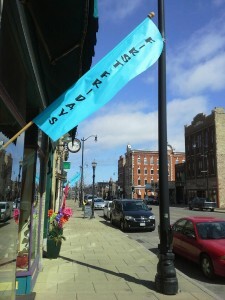 First Friday Season begins April 5th! Don’t miss your chance to shop late and explore all the cool shops, museums & restaurants in downtown Racine. We are right in the heart of it! 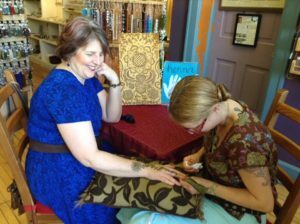 Adorn yourself with beautiful henna art from the lovely Luna, Renee Bebeau, from 4-8pm at Funky Hannah’s 324 Main Street. See the latest jewelry creations by the Funky Gals & be inspired to take a class and create your own! Our April & May workshop samples will be on display! While you are here, be sure to head around the corner to our sister business: Hot Shop Glass. Shenanigans are planned. First Friday Fish Fry at Hot Shop Glass, 239 Wisconsin Avenue! Our team of crazy glass artist & chefs will be doing demonstrations of glass fish making and cooking using the artistic material served up at 2000º. Whimsical demonstrations and a fish fry like you’ve never seen before, only at Hot Shop Glass during First Friday’s April 5th from 4-8:30pm. Join us for the best bead retreat EVER! It’s been a dream we’ve been mulled over for years. Our inaugural retreat last year was so much fun, we couldn’t wait for it to be that time again. Join us for the 2nd annual Door County Bead Retreat! Space is limited. We hope you will join us. Laughter, creativity and a memorable adventure guaranteed. Don’t miss out! Space is limited due to our open beading room and seats on the Trolley…so don’t delay in registering. Live in (or near) Door County and just want to shop with us? We’ll have a pop-up bead boutique at the Settlement Courtyard Inn, our host for the weekend. Stop & Shop with us Thursday, April 25th from 3-6pm, Friday April 26th from 10am-2pm & Saturday April 27th 9am-4pm! 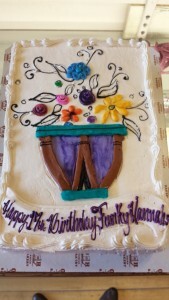 Happy 21st Birthday Funky Hannah’s! Party with us November 23rd 10am-6pm! Twenty one years ago we were hustling to open a store we’d been dreaming of for years! Many of you remember our first day — black Friday November of 1997! Bring your fond memories and stop in and celebrate with us on Friday November 23rd from 10am-6pm! We’ll be serving birthday cake and 21% off everything in the store* to celebrate! BIRTHDAY parties, BRIDAL parties, PRIVATE gal pal parties! Perfect for book clubs, church groups, Girl Scouts, work outings, and more! We have a great space in the back of the shop that is well lit and has seating for up to 12. There is a small kitchenette area with a refrigerator and microwave. Kids age 7 and older will have a blast at a Funky Hannah’s beading birthday party! Guests will make their own necklace and bracelet set using memory wire and their choice of charm and colors of glass seed beads. The cost is $112 for up to 8 children. Additional children are $14 each. 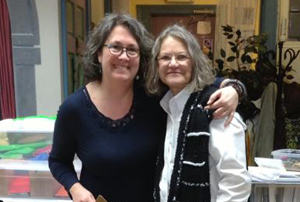 Fee includes all supplies, an instructor for the beading project, & use of the room. Parties last 1-1/2 to 2 hours depending on whether you choose to do cake and presents here or not. We schedule the parties during our normal store hours and recommend booking a month in advance as the same space is used for our beading classes. A deposit of $56 is requested at the time of reservation. Call or stop in to check date availability or for more information. We put the ‘FUN’ in Funky! Consult with our staff & design your own bridal jewelry and then have a party with your pals to make it! Cost will vary based on materials used. A $20 per person class fee applies & covers use of space, tools and instructor. Two person minimum. Want to get together with friends, family or co-workers and be creative? 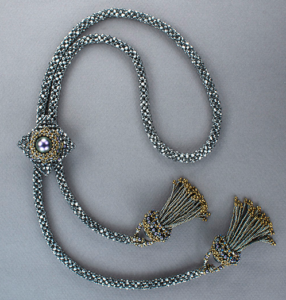 A basic necklace, bracelet or earring project is perfect for all skill levels. Cost is $20 per person and includes supplies. Looking for something more? Our other class offerings may be available as a private class for your group depending on teacher availability and group. Call us to see what we can do. Class fee is $20 and supplies are additional. Three new projects make their midwest debut! 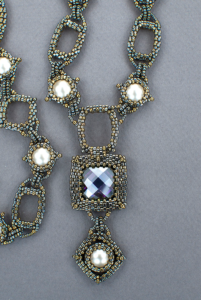 Don’t miss your chance to take a workshop with bead rockstar Cynthia Rutledge in the convenient, cozy classroom at Funky Hannah’s! Click on each piece for complete details! 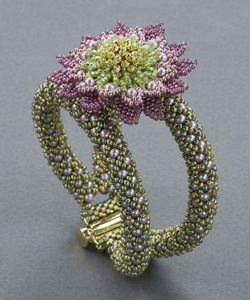 Classes are for intermediate skilled bead artists & fee is $95 per workshop, per day. Supply lists will be provided. Cynthia will bring kits for purchase as well as a trunk show of supplies used in her designs. Henna & a new Make & Take Pendant at Funky Hannah’s….First Friday is THE event in downtown Racine! We are full of creative fun, especially during First Fridays. Stop in and adorn yourself with henna from the magically talented Luna. 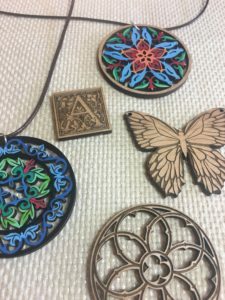 Our workshop area will be rocking with a fun all ages Make & Take — handpaint hardwood mandala pendants, letter pendants & more with materials from a trunk show from Tangible Light Studio. The trunk show kicks off during First Fridays and will run for one week. Don’t miss it! Detail of henna art by Luna during First Fridays last year. Don’t miss her visit in August and be adorned! 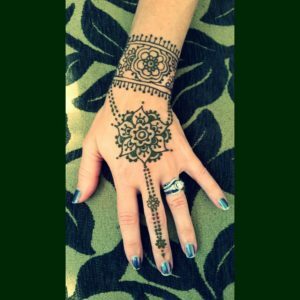 Henna art by Luna. Funky’s pal Leayn has already reserved her spot first in line at 4pm on First Fridays! 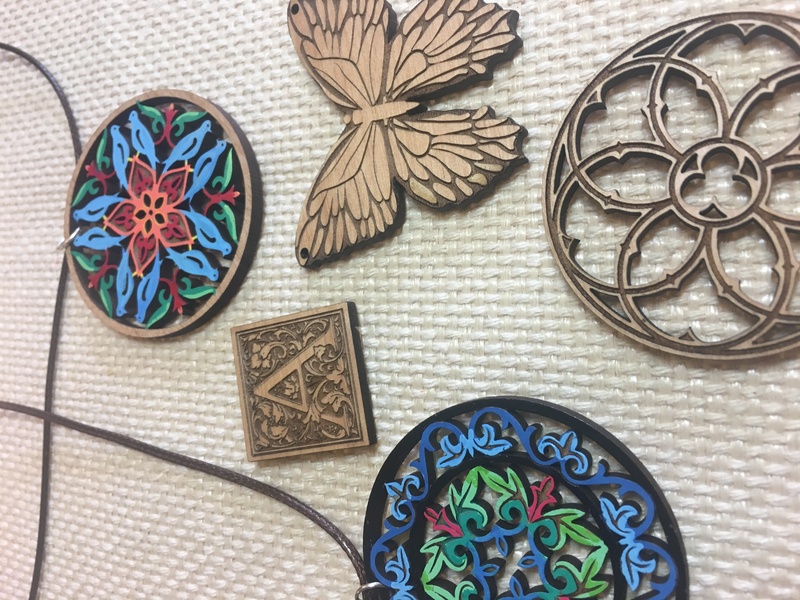 Wood pendants for the Make & Take during First Fridays. Be sure to visit our sister business — Hot Shop Glass, 239 Wisconsin Ave — it is the hottest, coolest place downtown! 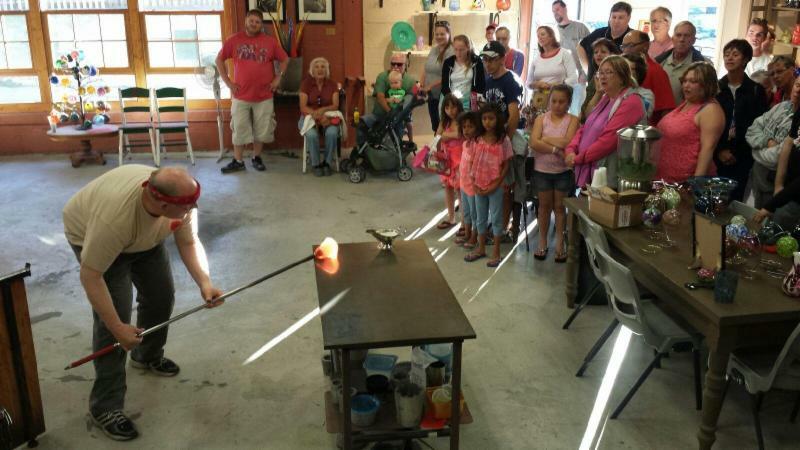 Watch as local artists turn 2000º molten glass into art right before your eyes! The whole family will want to pull up a seat and watch demonstrations from 4-8:30pm. Don’t Miss July First Friday’s in Downtown Racine! On July 6th, Enjoy the downtown festivities and celebrate freedom from cookie-cutter big-box stores this First Friday’s® in Downtown Racine on July 6, 2018 from 4-9PM. Bring your friends to Downtown Racine this year for the holiday! 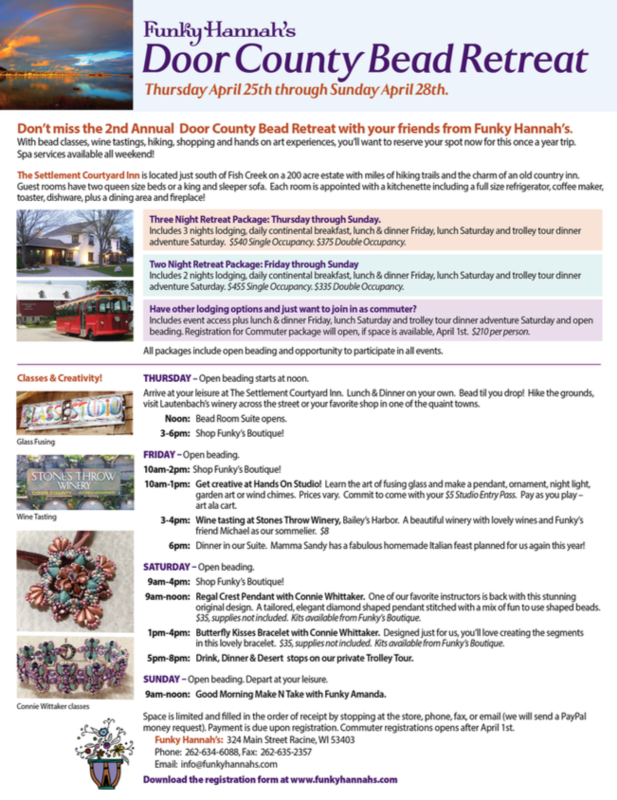 It’s a great place to spend a Friday browsing Racine’s unique shops, galleries and eateries while scoring some great First Friday deals like: The creative team at Funky Hannah’s is ready to wow you with all the cool jewelry YOU can make in our inspiring workshops! Stop in during First Fridays for a fun $10 make & take! 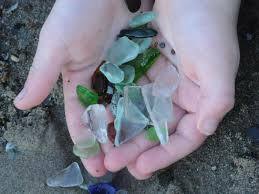 Bring in your favorite piece of beach glass or stone and learn to drill it and create a sweet necklace or key chain with it! Check out all the beautiful jewelry you can make in summer workshops. Don’t miss a stop at Hot Shop Glass, 239 Wisconsin Ave, during your First Friday explorations! This state of the art glass blowing facility allows visitors an up-close experience watching artists turn molten 2000º degree glass into beautiful functional blown glass forms or garden art. Stop in and be mesmerized. An ever-changing selection of locally made glass art is available in the gallery. Learn about the latest wedding crazy – unity glass! Come see the action at Hot Shop Glass. Mark your calendars for the fun events we have planned for 2018!!! 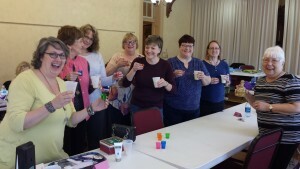 Here in town we’ll have fun classes, two bead camps, rock star classes, art walks, and fun when the Loose Bead Society is here for their annual retreat, as well as monthly First Fridays starting in April. We’re also taking it on the road, to bead shows in Madison and Milwaukee and our April bead camp in beautiful Door County! January 19th-21st at the DeKoven Center in Racine. Click here for details and registration.! As always, we’re inviting your favorite bead rock stars to join us this year. Watch our website for the latest details. Cynthia Rutledge will be here September 27-30th. Workshops TBD. Mark your calendar now so you don’t plan anything else! First Fridays resume in April! Plan to join us for a fun evening, every First Friday for the rest of the year!